Thanks for stopping by Murray's Lures & Trapping Supplies, your number one online trappers shop coming to you from Walker, West Virginia. We're a proud, family-owned company that’s been catering to our loyal customers since 1993 with our own special brand of top-quality products and service. Murray's lure & trapping supply store is run by trappers for trappers, and we only offer items for sale that we would (and do) use ourselves! That means at our trapping supply company you'll find nothing but the best materials, and if by some chance you're not fully satisfied with anything you get from our online trapping store, just let us know and we'll make it right with a refund. In addition to our fully stocked bait and lure shop, we also maintain a huge inventory of other trapping supplies such as traps, snares and trapline accessories. You'll also find a comprehensive collection of fur-handling and finishing supplies and a nice library of books and videos by numerous experts in the field. Also check out our awesome selection of outdoor clothing, pistol and rifle vaults, and emergency survival supplies. We continually restock our products and add new items, so make sure you check back with us frequently. Besides our wide variety of baits, lures and other types of hunting supplies, Murray’s thrives by placing customer needs before all else. We stand behind our products, keeping the trapper foremost in mind. If for any reason you are dissatisfied with one of our products, simply return it for a full refund (shipping excluded in some situations). Make sure you check out our schedule of upcoming convention appearances where you can meet us and shop for some of our products in person. 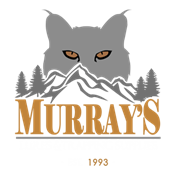 Thank you for choosing Murray’s for all of your hunting and trapping needs.